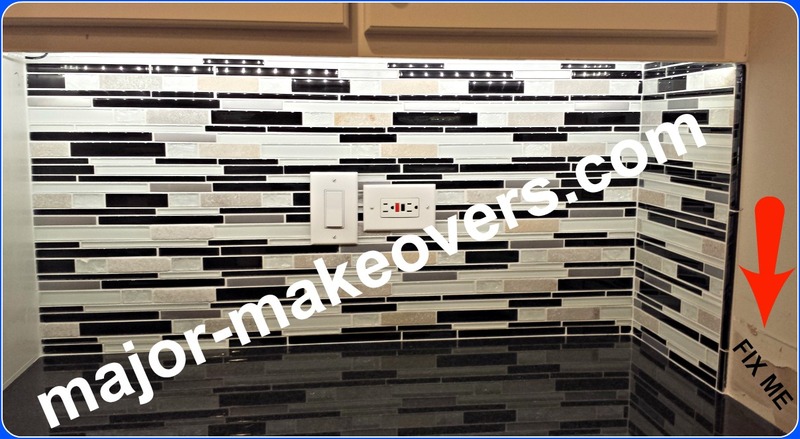 Backsplash Tile Installation | SAVE 20% at THE TILE SHOP NOW ! This black and white backsplash tile installation project was done in a big kitchen in the affluent Chicago suburb of Hinsdale. The backsplash spreads over 3 separate areas of the kitchen and it's at least double in size compared to an average size house/kitchen. 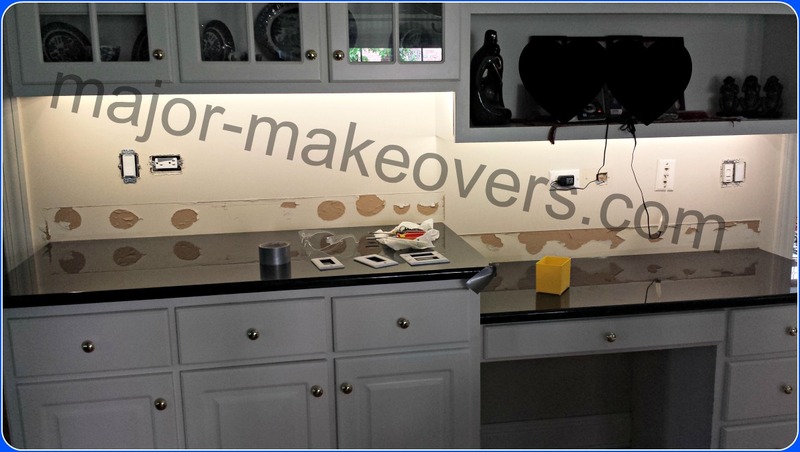 You can see more details about the backsplash in the above picture as we go through the steps of this Hinsdale tile project. This may also be useful if you're thinking to get a new kitchen backsplash and what to expect during installation. 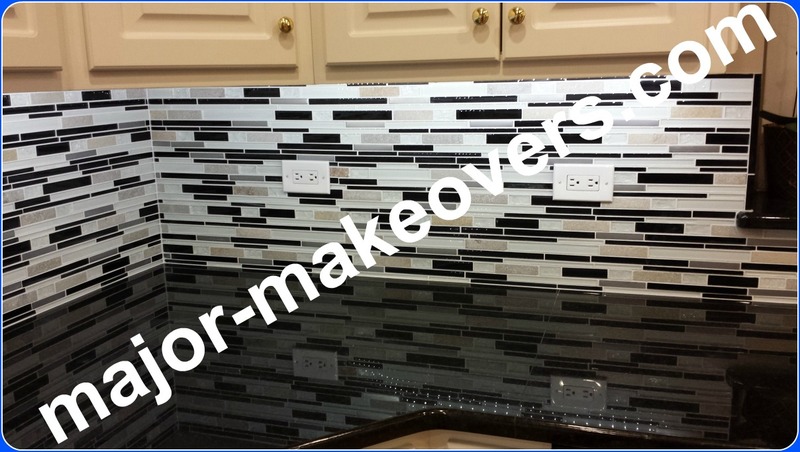 Jump over the installation work to see pictures of the finished Hinsdale backsplash. This is the smallest area of the 3 separate 'backsplashes' of this kitchen. The peeled paint/drywall and other wall damages are what's left after the homeowners had the old countertops and their matching 5 in. backsplash removed. The new countertops are installed but no matching 4-6 in. backsplash because the homeowners prefer the new backsplash tile installation to start right on top of the countertop. The tile will cover most of these damages but some will be fixed later by a drywall guy after the backsplash tile installation is grouted and complete. One of those areas to be fixed later starts by the letter 'o' in the above '.com'. The tile will stop at the end of the top cabinet and run straight down on a vertical line that probably runs through the 'o'. This second area includes a countertop height drop to the level of a desk/table which comes in very handy for kids doing homework in the kitchen or anyone else needing a chair and desk/table height incorporated within the kitchen cabinets. The upper cabinets are also lowered exactly on the same area where the countertop is lowered so this will make for an interesting task of perfectly aligning the thin tile strips to sit on both countertops in full pieces and also run left-right uninterrupted from one countertop to the other. You can also see the peeled paint spots where the countertop backsplash was glued to the drywall. These areas will be covered by the new backsplash tile installation. Both left and right ends of this drywall have wooden door trims and that's where the new tile will start/end. There's a 3rd main area which is an L shaped wall. You'll see it later, not in a 'before' picture but in a 'during' picture and then the 'after' versions. Tile installation begins on smallest backsplash area. After their covers were removed, both the switch and outlet seen below needed to be loosened from their screws and pulled away from the wall a little to make room for the tile pieces to get in their place at the time they reach that area. The first 12 inches of tile are installed on the back wall already and there's less than that left to install up to the bottom of the cabinet. The wall on the right side will only get tiled up to the end of the cabinet and the 'wall' on the left is actually part of the cabinets (not drywall) so it won't get any tile. Protecting the countertops while work is going on is a top priority and in order to take pictures during work, most tools and drop cloths were removed so the countertop can be seen together with the new tile. Backsplash tile installation during work on 3rd main area. The L-shaped main area of this backsplash is shown below. The first row of 12 inch tile sheets is already installed. 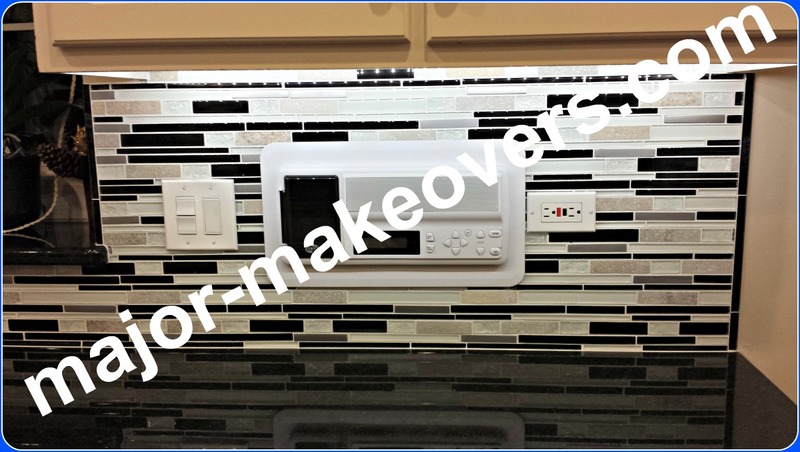 There are quite a few (hard to see) switches, outlets, phone jacks and other things in the way and each of them needs to be partially removed so the backsplash tile installation can take place. The biggest thing in the way is the intercom panel which was disconnected from the wall without disconnecting any wiring, and it just sits on the countertop for now. It will be placed back in its place in the big empty area inside the wall seen on the right side of the picture, after grouting is done. Close-up from wall corner to window. This close-up picture was taken before the above one but it gives you an idea about the look during the actual tile installation. Notice where the 2 red arrows point - there's a vertical line marked on the wall where the tile ends and there's about 3/4 of an inch to where the wall ends. That 3/4 in. is left on purpose so a vertical tile can be installed as an edge (trim, bullnose) to the backsplash. For a perfect match, the vertical tiles were chosen from among the black glass pieces. 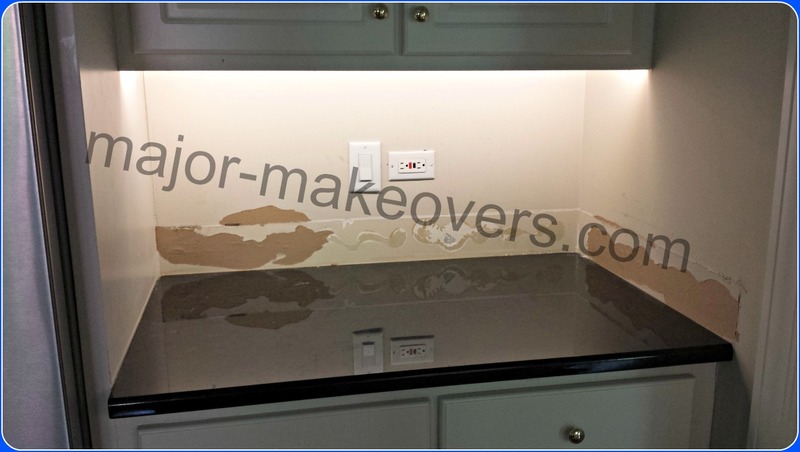 This procedure was done anywhere where the backsplash ends without having a door trim, wall corner or other 'obstacle' in the way. Those are tile wedges (V-shaped plastic pieces) and their purpose is to keep tile pieces aligned until they dry. Even though tile manufacturers do their best to impress you with beautiful products, there's a lot of 'behind the scenes' you never know about, and many times an installer has to 'fix' manufacturer issues. For instance, most of these long tile strip kinds are all nice in the store and, being packed individually, you don't get to interlock 2 sheets and see that sometimes instead of seeing 'space-tile-space', you see 'no space-tile-double space'. This hapens because sometimes the manufacturer doesn't make perfect spacing and wedges are needed at instalation time to keep things aligned overnight so they dry in the right position. Same area as above after more backsplash tile installation. Remember where the 2 red arrows were pointing? Now we have a nice black glass tile trim made from the same tile to perfectly finish the edge where the wall ends. You can also see more of those tile wedges keeping even spaces between tiles that were not sitting straight. Both outlets ar 'hanging out' overnight so the tiles can dry in place and tomorrow they will be installed back in place. Part of planning this job before it started was also making sure a certain amount of tile strips/rows can fit under the window (low-right corner) without having to cut thin long strips of glass in half or so, on their length. Intercom panel out of the wall during tile installation. Moving over on the other side of the window, we have the intercom resting on the countertop while tile installation is going on all around those many wires, switches and one outlet. Tile wedges also keep a small gap between the countertop and the backsplash so the grout can get in there too at the right time. 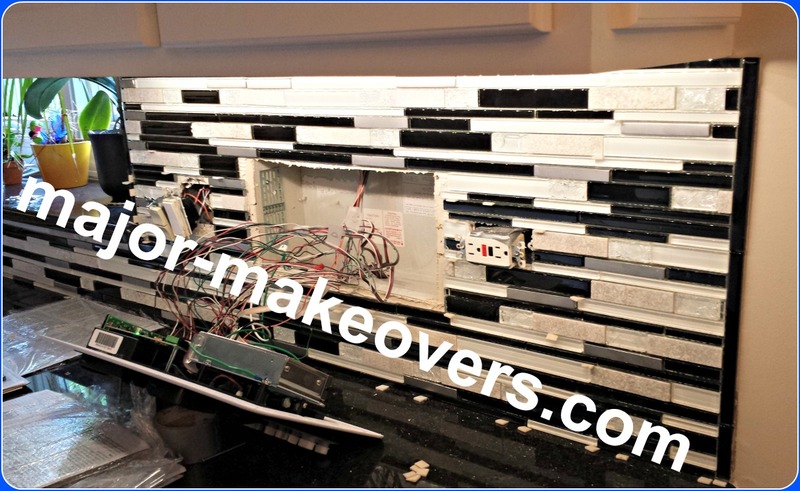 You can also see one end of the backsplash on the right side where the same black trim made form glass tile strips is installed to finish the edge. After the backsplash tile installation was finished, an overnight drying time is needed before the next step which is grouting. 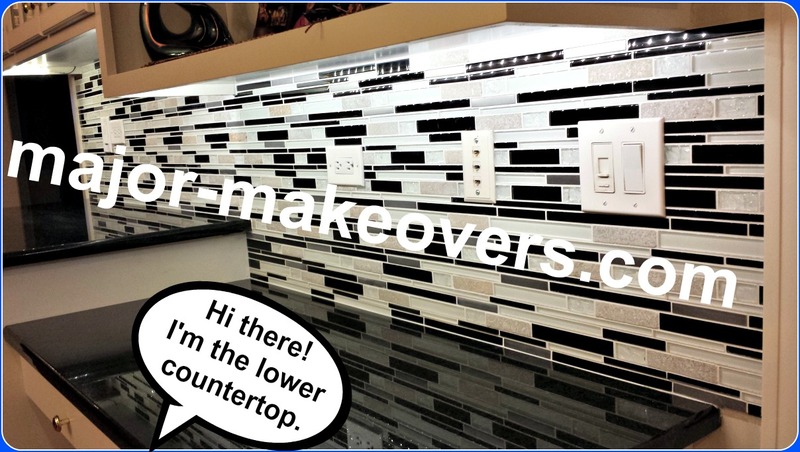 Grouting the backsplash tile & more info. All switches and outlets must be placed back in their position except now they'll 'sit' at the surface/level of the tile as opposed to the drywall before.This process assumes the tile installation was properly done around the switches/outlets. If any tile is 'in the way', there's no room for the bolts holding the switch/outlet to go through and if the tiles are too far away, you may find it very soon that when you go plug something in an outlet, one or both sides of the outlet are pushed inside by about half an inch. Not good. After all switches and outlets are installed back in place, we apply tape over their surface to protect them from grout. Their covers are not installed yet. All the wedges and/or tile spacers are removed and a visual check up is performed to make sure spaces are clean and nothing sticks too far out to be in the grout's way, which may show through the grout afterwards. All tools and drop cloths are removed from the countertops and the counters are perfectly cleaned at this point. Then plastic sheets are taped very close to the bottom of the backsplash tile installation so the countertops are perfectly protected from the messy grouting process about to start. After grouting is done, the tape that was on outlets and switches is removed and their plastic/metal/etc covers are installed back in place. In our case with the above intercom panel, now it was the time to install it back in the wall. The careful removal and 'folding in' of the plastic sheets from the countertops ensures that all grout leftovers and other debris are taken away with the sheets, leaving behind a brand new backsplash tile installation and clean counters! Nowadays many grouts have sealer in them already (grout never needs to be sealed) but some years ago that was not the case. If a grout sealer application was needed, it would usually take place a few days later after the grout has cured. New plastic sheets would be spread all over the counters to protect them and sealer application will take place. Even though grout sealers may not be such an issue nowadays, sealer is still needed for some porous tile that can be stained from daily kitchen activities or even before that, at grouting time (grouts can stain some porous tile). One example is porous travertine tile that should be sealed before grouting and could even require 2 coats of sealer. This is probably way more than you wanted to know about grouting, etc but it gives you an idea of what's going on behind the scenes of what most people think of as a 'simple' backsplash tile installation - after all, it's usually a very small area. 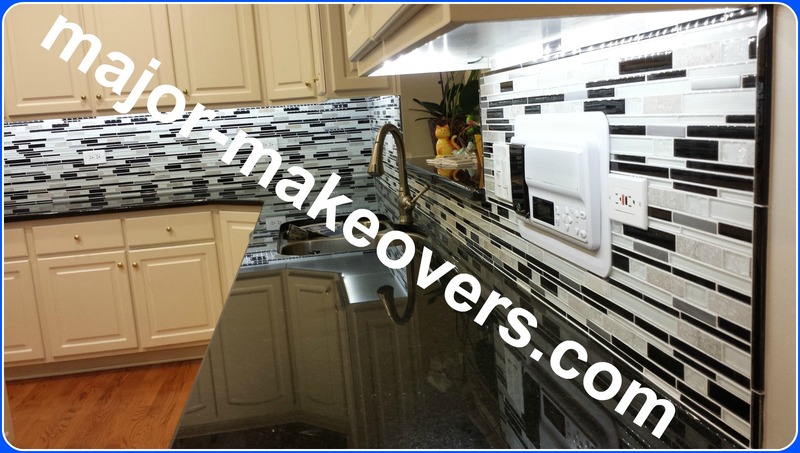 By the way, this black and white glass backsplash work took one professional 4 long days to fully complete. This finished area is the smallest of the 3 areas, as you can remember from earlier. Now you can see exactly where the tile ends on the right side wall and the black glass vertical tile trim that complets the edge. Still there, is the drywall damage to be fixed later by a drywall repair person. Kitchen countertop at table/desk height. This is the second area where we have the 2 countertop levels and both ends of the backsplash tile finish off against wooden door trims. Due to the fact that the tile rows/pieces have different widths, careful planning was needed before the installation to make sure the tile will sit in full pieces on each countertop (no cuts) and run smoothly left-right over the height difference. The bright under cabinet led lights make for enough light for this countertop/desk. There's a door trim on the left side where the backsplash starts... then moving to the right we reach the corner then the other side of the L shaped backsplash area takes us at the edge of the window where the vertical black trim is seen. This above picture is just half of the main area and the picture below continues from the left side of the window to the right and you can also see the intercom installed and the black trim at the end of the backsplash. The window sill is the same material as the countertops and sticks out from the tile surface and has rounded corners. Close-up on main backsplash tile installation area. If you followed every picture on this page, you remember this next picture as the finished version of the other pictures seen during tile installation. Window sill starts at the right side. Here's a close-up on the intercom area surrounded by electrical switches and outlets, all properly installed back in place. This black-white-gray bright backsplash may be the perfect blend between black countertops and white cabinets even though the color of the cabinets in these pictures doesn't seem to be a perfect white due to it being influenced by the kind of lightbulbs on the kitchen ceiling which make the cabinets look off white. And the last picture of this tile project shows you most of the main area seen from the end of the backsplash where the intercom panel is. If you were to stand in this kitchen by the island in the middle of it, you'd see this beautiful backsplash as you turn around as it is displayed on 3 walls in 3 different sections not connected to each other. There's no 4th wall to the kitchen as it is fully open to the dining and then livingroom. Hope you enjoyed following along this tile project. 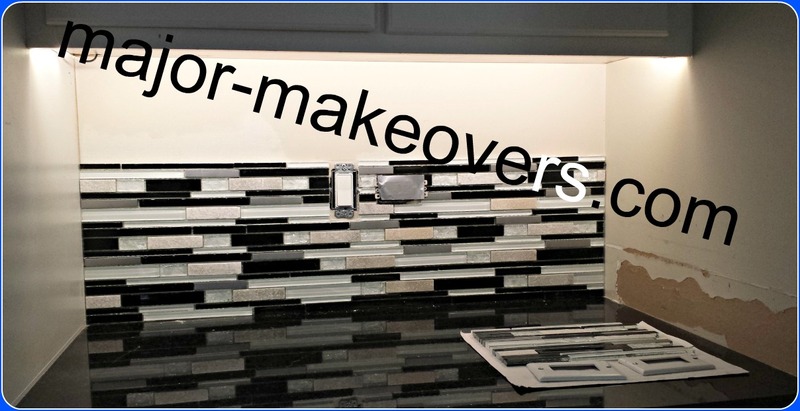 You now know some of the things involved and what to expect when time comes to have your backsplash or other tile projects done in your home.